Lowe’s--four pressure-treated 4x6x12 pieces of lumber to build the foundation for my greenhouse. Also two tools Peter needed for the greenhouse project. McAlister’s for lunch--because we were starving and wanted to eat quickly to get back to work on the greenhouse project. PetSmart--a pack of chew bones for the dogs, since Chloe decided to chew a blue marker this a.m...and we now have blue marker all over the carpeting throughout the house. Why couldn’t she just stay in one spot to chew the marker? It would have been annoying...but so much less so. On a happy note...I planted lots of heirloom garlic today, and I harvested the remaining basil tonight, since we might have frost. 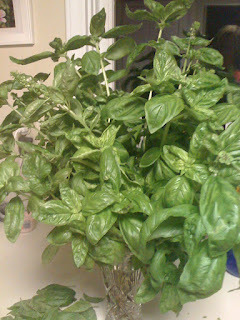 Tomorrow, I’m making a boatload of pesto...and I must say, my hands already smell delicious. I’m taking my consumerist self to bed and hoping for better success tomorrow...Trash Day.